Availability and delivery time: On request, in 20 days. 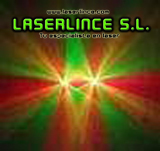 Laser: 30mW@532nm and 100mW@650nm+30mW@532nm and 100mW @650nm, Double RGY DPSS laser. DMX512: Seven channels control with the function of ' BLACK OUT '. Medidas de seguridad: Sound active mode with the function of shut-off if there is no music. It is designed according to the security and good performance, which will be safer to human and environment. Modes of Operation: Sound Active, AUTO, DMX512 (7 channels), Master/Slave. This product was added to our catalog on Sunday 18 January, 2009.